And now for something completely different. As many of you know, my wife comes from a long line of quilters. She can wield one mean sewing machine. Not surprisingly, many of the best quilters have a solid design background. So, while I don’t have the sewing chops, I thought I’d take a stab at the design side of things. 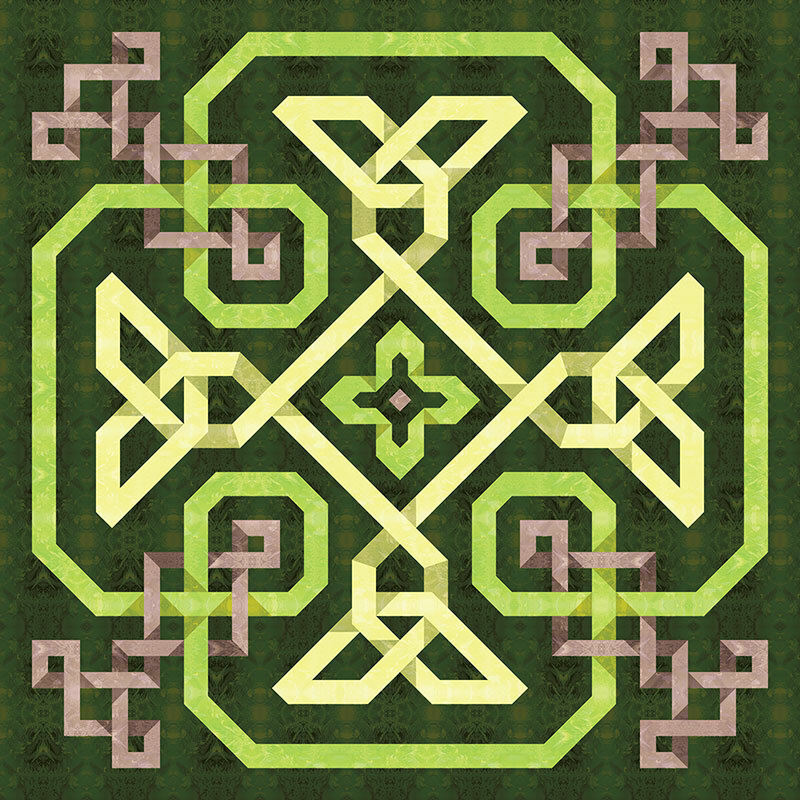 For this initial quilt design, I interpreted shapes found in traditional Celtic knots. Converting these very organic and dimensional forms into manageable fabric shapes was an interesting challenge. Colors were inspired appropriately by thistle blossoms. Farming Reference Guide – African Style! So, it turns out I’m an expert farmer! Sort of. Earlier this spring, a team from Sioux Falls set off to Kalalayi in Southern Sudan. The primary goal of the trip was to provide a well for the village, which was desperately needed. While there, the team also wanted to work with the locals to improve their schools, religious instruction, and farming techniques. No sweat, a week or two should be plenty of time, right? This sounds like a job for a designer! 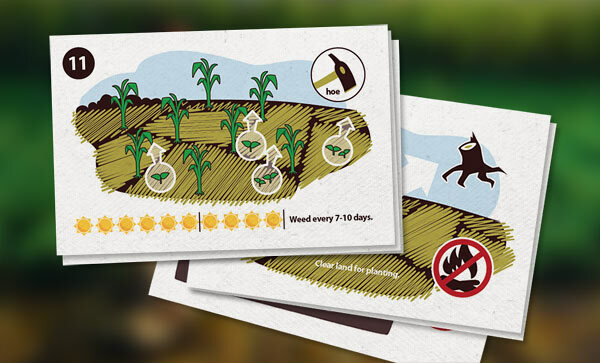 As a small piece of the puzzle, I volunteered create a guidebook that outlines the basic steps in the Farming God’s Way curriculum. The challenge was to ensure the design could communicate clearly without relying on words. (A few people in Kalalayi can read a little English.) The final product was a set of laminated cards that were spiral bound along the top edge. With any luck these guidebooks will provide an easy reminder of the training the farmers received while the team was in South Sudan. Sometimes you just can’t find the image you’re looking for. I figured it wouldn’t be that hard to find a decent stock photo of a chef or lunch lady dishing up a ladle of glop. I mean, what else is the internet for? No dice, however, and I ended up having to shoot this background photo myself. Oh, and the grubby stains on the shirt? Nothing more than a decorative spattering of flour and water. 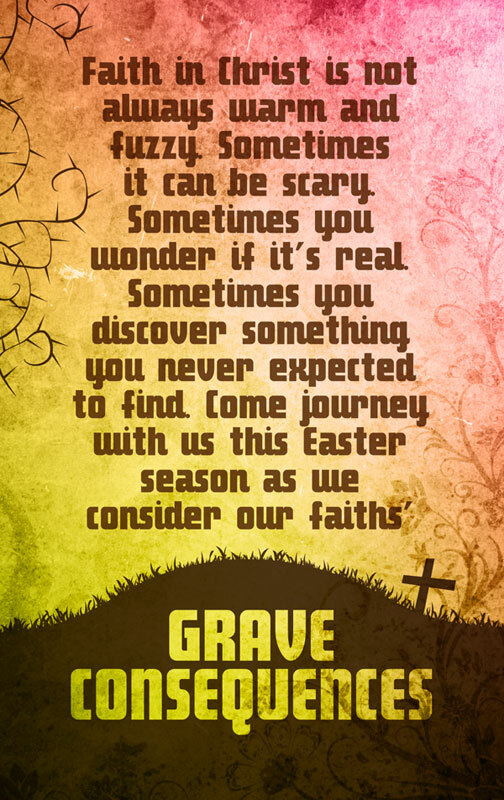 I seem to be in a rut lately, posting nothing but these sermon series posters. I’ll mix it up a bit more, I promise! 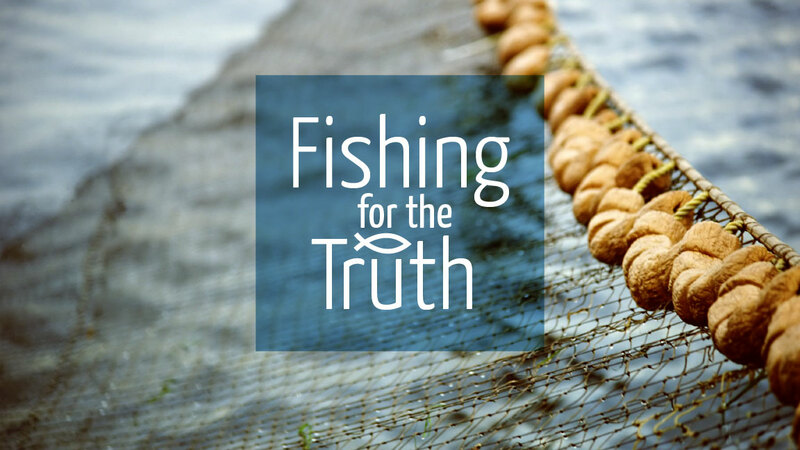 I have just what you’ve been waiting for… Another sermon series design! I started out wanting to do a photo-driven layout, but couldn’t find images I was happy with. This is the first design I’ve drawn entirely on my Wacom tablet without working from a literal pencil sketch as a template. It worked great for the style I was shooting for, although any tighter line work would be hard to achieve this way. 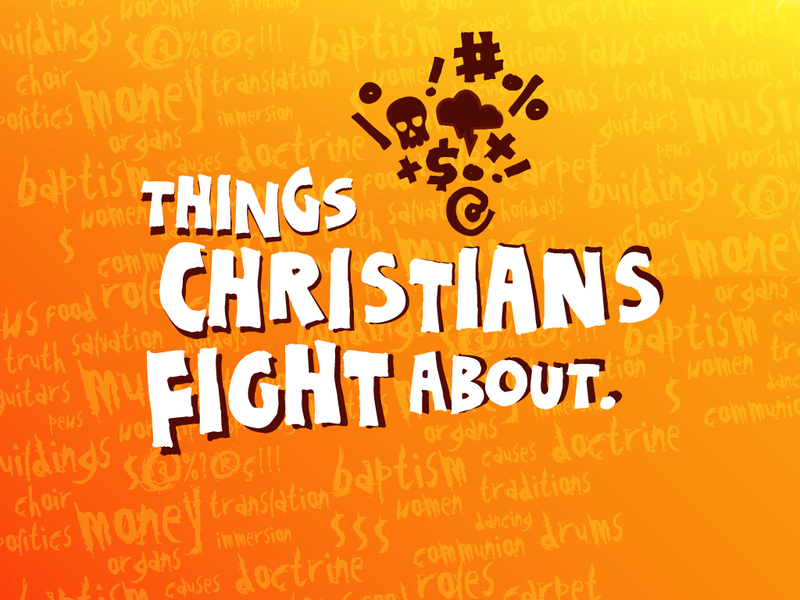 We’re doing a month long series at church on “Things Christians Fight About”. It is always good to stick with the safe topics like this. I did some supporting graphics, including the spicy title screen above. 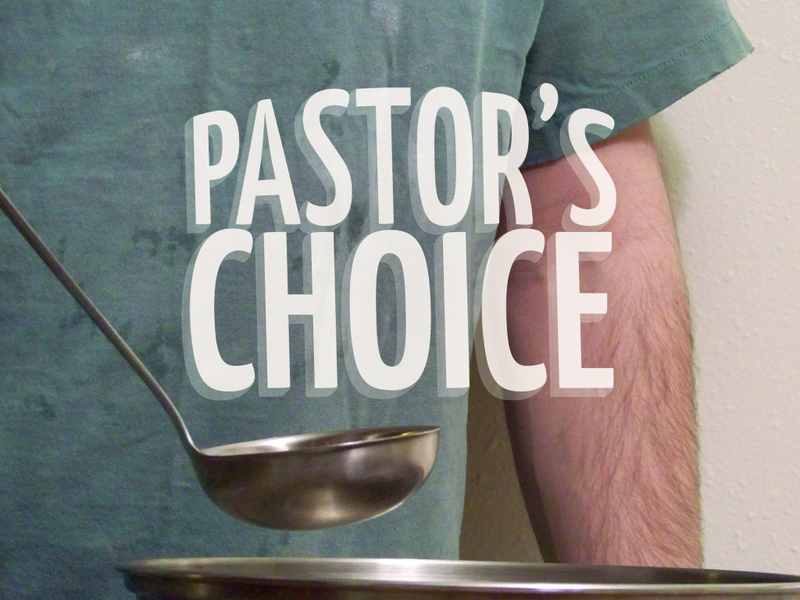 In all my “free time” I’ve started volunteering over at Hillcrest, doing the graphics for each upcoming sermon series. It is a fun excuse to try some new things, and small enough projects that they aren’t too much to squeeze in edgewise some evening. This Grave Consequences poster is the first one I did. 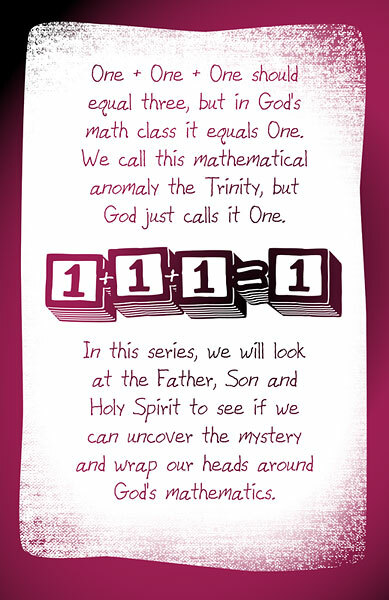 It introduces the series leading up to Easter this year. Around my house we always seem to sucker ourselves into creating at least a few hand made Christmas gifts. The wild goose chases trying to find obscure materials are always epic. 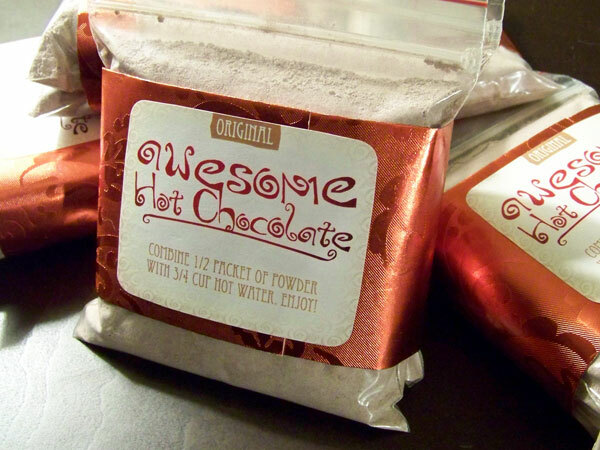 This year one such gift was a batch of fancy hot chocolate mix. First we had to find and perfect a hot chocolate recipe. We were forced to drink many steaming mugs of hot cocoa over the course of our research. It was grueling work, as you can imagine. We needed packaging for our “awesome hot chocolate.” I didn’t want to resort to the classic, but not very classy, canning-jar-with-label technique. After some goose chasing, we were able to supply ourselves with plastic bags from a candy-making supply store that looked perfect. Of course a zip-lock bag full of powder isn’t exactly decorative. 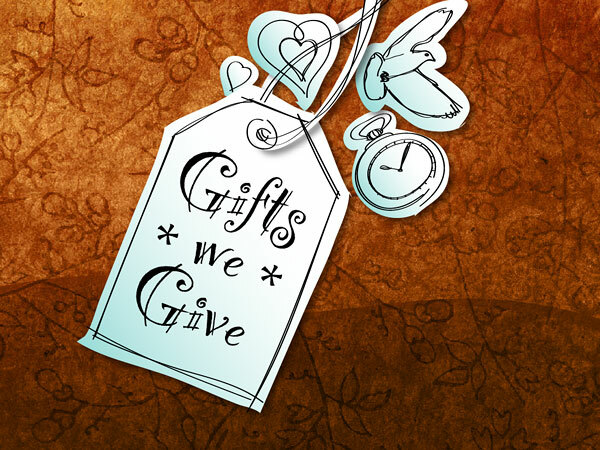 Dress it up with some shiny foil wrapping paper, however, add a whimsical custom label, and you’ve got something nearly presentable. You’ll notice we’re still transporting plastic bags full of a fine powdered substance… across state lines… so look for us on the news this Christmas Eve.